We continue our look at the CoStar’s State of the U.S. 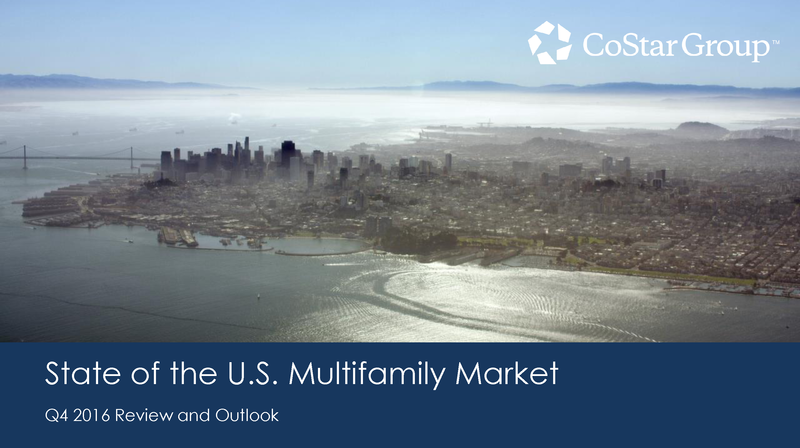 Multifamily Market presentation by digging deeper into the individual multifamily metro markets and how San Diego in particular continues to see record coverage. Discussing multifamily from an individualistic level, Michael Cohan, an industry expert within CoStar, maintains that vacancy in specific tiers of metro areas has actually helped maintain solid fundamentals. “New development is providing little relief to the workforce housing challenge, as new construction is catering to the top of the market” Cohan suggests that this lack of affordable units over the past two years has induced the greatest vacancy expansion in Tier 2 metros. Since mid-2014 Tier 2 vacancies have risen by 120 basis points, to 7.2%. Among these Tier 2 metros seeing dramatic shifts due to low inventory is San Diego. 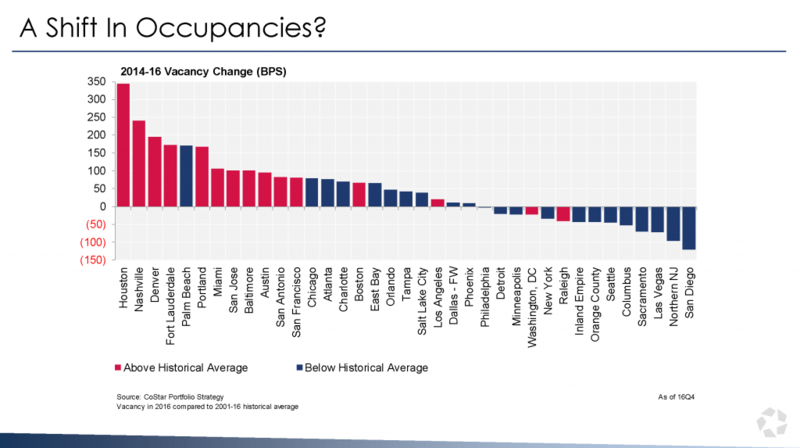 “San Diego sported the sharpest vacancy contraction through 2016, falling 121 basis points” Cohan confidently voiced near the conclusion of his presentation noting that overall, most metros have become historically softer, and we can see metro vacancies ticking up from 2014 to 2016 numbers. San Diego was joined by Northern New Jersey and Las Vegas as the top three markets seeing below historical averages in vacancy. Conversely, Houston, Nashville, and Denver topped out the historical average vacancy change, with Houston coming in just around 345 basis points. San Diego also continued to maintain a solid position in the top 15 for year-over-year rent growth, leveling out at 4.0%. This lowest vacancy rate translates to great news for property investors, but I also raise the question of how long such a steady historic trend can last. 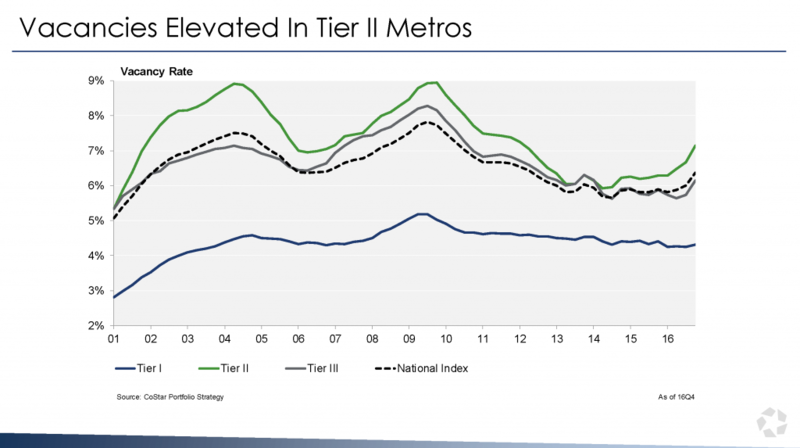 Cohan further notes that Tier II markets (the current metro tier in which San Diego identifies) are showing a consistent trend in elevated vacancies over the past few years. In spite of this trend, San Diego was one of only five Tier II metros to reach the top 20 rent growth markets (the others being Phoenix, Orange County, Portland OR, and Dallas – Fort Worth). 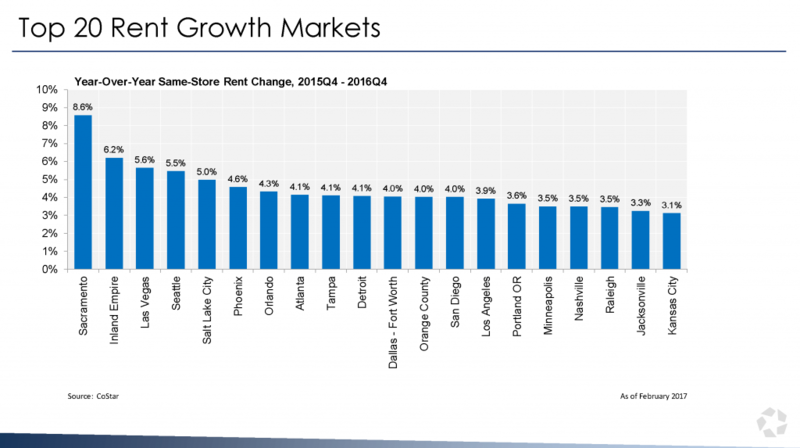 San Diego maintained a respectable middle of the pack positioning at 4.0% for Year-Over-Year same store rent change. San Diego continues to show its prowess as a city of discussion. At a recent panel panel for the Burnham-Moores Real Estate Conference, professionals from military, tourism, foreign relations, and bio-technology presented San Diego as a diverse hub where many industries can work together. “You don’t see this kind of collaboration in other places” explained Mark Cafferty, president and CEO of San Diego Regional Economic Development Corp who moderated the panel. An influx of industry professionals and start-ups looking to find work has extended low vacancy beyond multifamily. Cristina Hermosillo suggests that with $3 million in completed construction, industrial space had as low as 3% vacancy in 2016. This desire to work and grow has driven not only industries, but their workers to maintain a presence in San Diego. Such a drive for the work force is what will keep San Diego multifamily investors maintaining a solid asset line with “less volatility then other property types” Lee Everett of CoStar Group concludes.